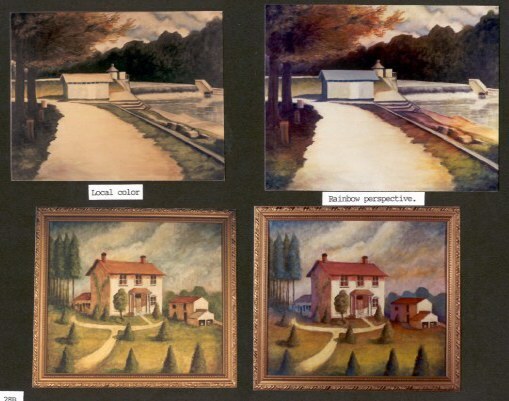 Before-and-after examples of paintings reworked with RAINBOW PERSPECTIVE. Any two-dimensional art application can benefit from the amplified optical illusion of depth made possible with CHROMATISM. It can work in art, printing, photography, television and in computer applications. 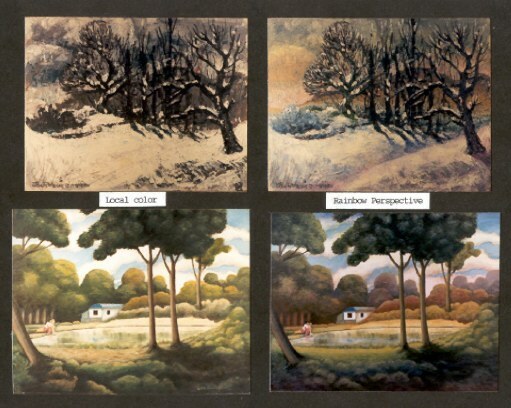 Note below how RAINBOW PERSPECTIVE organizes the original tangle of trees, (left), onto separate planes of depth, (right). As an artist, you may not be interested in painting a picture in rainbow colors. However, that's not the object. You have probably used a color's complement, whether it was found in nature or not. Artists such as Delacroix painted red complexions with green shadows, often disguised with, and integrated into, local color. The CHROMATIST painter integrates shades of spectrum colors into the picture's local color so there is just enough to provoke the eye lens to react to different angles of focus. Depth in this Chromatist painting is achieved by the use of RAINBOW PERSPECTIVE. May I suggest that if you would like to experiment with CHROMATISM, (the painting technique based on The Theory Of RAINBOW PERSPECTIVE), that you choose an old or unsatisfactory picture that you have rejected. Lightly glaze, stipple or wash spectrum order colors onto successive picture planes to determine for yourself how effective the full optical illusion of RAINBOW PERSPECTIVE can be. You have nothing to lose and you may gain an appreciation for CHROMATISM'S optical illusion,....and at the same time salvage a masterpiece.